All Revoice processes have to be rendered to create audio tracks before they can be auditioned or the results saved/exported. This rendering process can be done in the background while you continue to work, or it can still be done as for earlier versions, either upon pressing the space bar to play the output track, by pressing the Run Process cogwheel button at the bottom of the display, or by pressing CMD-R. The processing cogwheel shows red when a process needs to be rendered or red and turning when the system is processing. If a process has not yet been rendered, a red line will show across the top of the track concerned. Single Thread does not work in the background and uses just one CPU core. Multiple Thread does not work in the background and uses all available CPU cores. Background works in the background and uses all available CPU cores. 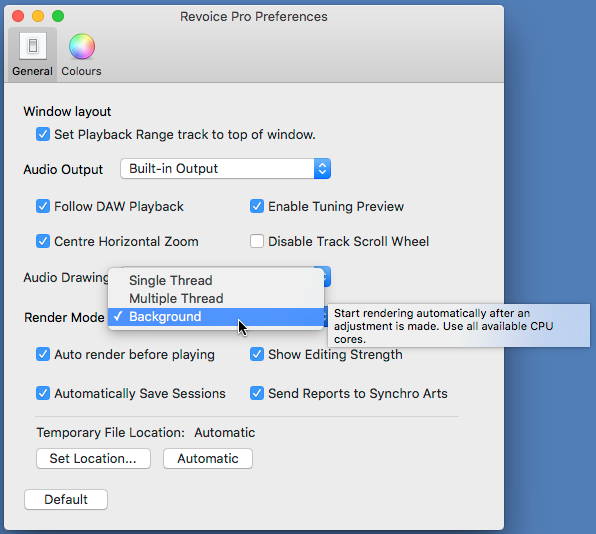 Select Auto render before playing when background processing is off to have Revoice Pro render audio automatically when you start to play an unrendered track. If unchecked you have to press the Run Process button shown above, or press CMD-R, to render audio manually.